Planning a wild night out in Dallas? You and anyone in your group who needs fast, reliable transportation should look no further than Longhorn Charter Bus to coordinate their evening. Accessing thousands of party bus solutions within the Dallas area, Longhorn Charter Bus specializes in making sure that every client’s night goes exactly according to plan. No matter what the occasion is, Longhorn Charter Bus is prepared to make sure your night goes off without a hitch. When you book a private party bus with us, you’re guaranteed a high-end luxury experience tailored to your event. From weddings and birthday parties to corporate celebrations and family functions, there’s no event that we won’t service. We understand that solutions must be tailored to a group’s needs based on the type of gathering being held. Because we have access to motorcoaches for groups of every size, we’re able to book party buses that range in size from 20, 40, and even 50 passengers. To further service our clients, we also make sure that solutions may be tailored to include features such as WiFi, restrooms, heated seats, entertainment centers, and more. It’s important for every passenger to be in safe hands during a wild night out in Dallas. 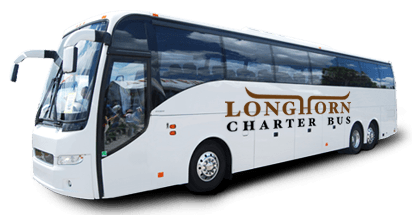 When a large group is traveling with Longhorn Charter Bus, they’re guaranteed a bus that’s loaded with premium safety features and a highly-professional driver. Your driver is assigned to be your own personal chauffeur, taking away the risk of any on-road complications or potential DUIs. Don’t put your night at risk, book a private bus to handle your late-night excursions. With a private party bus, you’re able to curate your passenger list and itinerary according to your desires. Choose as many destinations as you like, make a schedule that makes sense to you, and keep your group on a unified front while you explore Dallas’ nightlife. Never waste another moment waiting on a rideshare service or public transit; take control of your night and book a private motorcoach with Longhorn Charter Bus. It’s time to start planning your night on the town. Don’t waste another moment trying to make things work with a transit provider that doesn’t meet your requirements; reach out to Longhorn Charter Bus for more information today by calling 214-206-8432, and learn more about popular locations in Texas here.